Not too long ago I posted a photo on social media of all the books/decks that I have yet to write reviews for and asked for people’s opinion on what they’d like to see first. 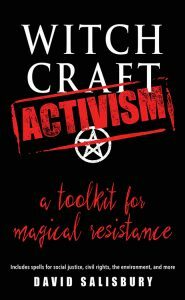 The overwhelming response was to review “Witchcraft Activism: A Toolkit for Magical Resistance” by David Salisbury next. I can’t say as I blame anyone who voted for it. In this time of political upheaval people now, more than ever, are looking for a way to take action. The good news is, “Witchcraft Activism” gets the job done. Obviously if you’re a magical practitioner, the idea of effecting change with magic isn’t an outlandish idea. However, I was happy to see Salisbury clearly show the similarities (similarities that never occurred to me) between magic and activism. Both require a serious reflection on intention and the work of follow through. Salisbury has a background in activism and takes you step by step through any type of activism that may interest you: lobbying, letter writing, marches, and more. Then add to that an inspiring number of ways you can utilize magic to reinforce and improve on those actions! He discusses sigils, candle spells, spirit servitors, and of course, more. David Salisbury has created a great guide for aspiring activists. You could ignore all the magical elements and still walk away with a fantastic book on activism. As far as I’m concerned, the informative magical information is just icing on the cake! Highly recommended!